Plymouth manager Derek Adams has called on his side to put in "away performances" at home, after losing three of their past four at Home Park. Argyle average two points per game on the road, the best in League Two, despite having the furthest to travel. 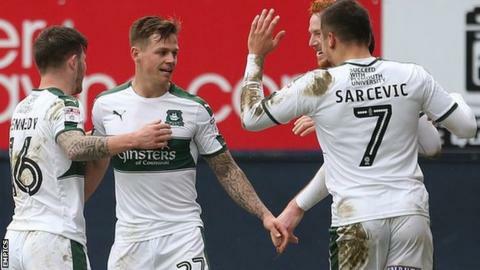 On Tuesday the Devon club wore their away kit in a home match at Home Park, but were beaten 3-0 by Blackpool. "We're probably too open at home in some games, against opponents our fans feel we should beat," Adams said. "We just have to change that between now and the end of the season. Our home record is good, but our away record is the best in the league. "At times this season when we have been at home we have opened up too much, and we've had the onus on us to go and score goals. Sometimes that is not right, and we just have to tighten up. "We probably have to change our style of play at home to an away performance." Argyle are second, six points clear of third-placed Portsmouth, as they look to end their six-season stay in the fourth tier. Captain Luke McCormick added that having three of their next four games away might be a good thing. Goalkeeper McCormick told BBC Sport: "We've done very well away from home, got one of the best away records in the league, so we can go with that confidence that we are good on the road."